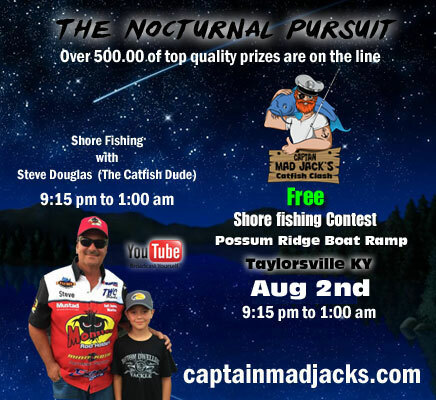 HEY, catfishing fans, on Friday, Aug 2nd, 2019 I will be at Taylorsville Lake in Taylorsville ky hosting the Third season of Capt Mad Jack’s Catfish clash. It’s a nighttime catfish tournament. FREE shore fishing contest from 9:15 pm time til 1 am. We have some nice sponsor prizes for 1st, 2nd and 3rd biggest fish caught during this time period along with some parting gifts to be given out to the contestants who participate. No unsportsmanlike conduct will be tolerated. Must abide by Local and state regulation. 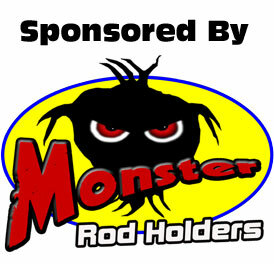 Fish must be caught during the contest hours Start time 9:15 pm contest ends at 1:00 am all anglers must be back to the weigh-in site by 1:15 am to avoid disqualification. All fish caught over 15 lbs must be returned to the lake. No stringers allowed on fish over 15 lbs, (Conservation awareness). Fish over 15 lbs must be weighed and entered into the contest as soon as it’s been landed so we can be sure of a healthy release. We will allow contestants to keep their fish under 15 lbs once they are weighed and documented for table fair if desired. Must abide by all lake creel regulations. No fires along the banks, State law prohibits fires along the banks so be sure to bring your Coleman lanterns or LEDs for lighting. No alcohol or drugs will be tolerated.